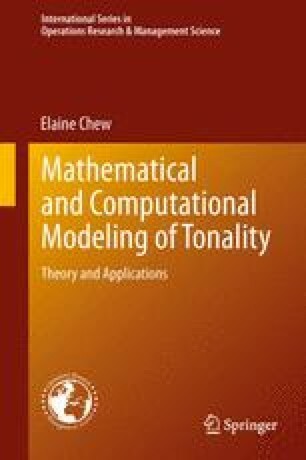 This chapter weaves together a backdrop of related work in music theory, cognitive science, and operations research that has inspired and influenced the design of the Spiral Array and its associated algorithms. The chapter begins with an overview of the Spiral Array model and its core ideas. This is followed by a review of some spatial models for musical pitch that have informed the model’s design, and an overview of the Harmonic Network (a.k.a. the tonnetz) and some of its applications. The idea of the center of effect (CE) is central to the Spiral Array and its associated algorithms. The idea of the CE draws inspiration from interior point methods in linear optimization. The second part of the chapter describes the von Neumann Center of Gravity algorithm and Dantzig’s bracketing technique to speed convergence, and then draws analogies between the algorithm and the CEG method.